I’ve been working on our spring mantel for a few weeks now, but I finally got it finished this weekend. And I really hadn’t planned on using pink, but that just seemed to happen serendipitously. The best things happen that way, don’t they. It all started when I found this faux moss covered bunny several weeks ago. When I placed him on the mantel, I knew he was going to stay. I was looking around for a place to hang this wreath this year and decided to try it here on the fireplace. I’ve used it on our front door for many, many years and the flowers and painted eggs have never faded. Last week the grandgirls were here, and Ruby, the youngest, helped me make this arrangement in the glass vase. 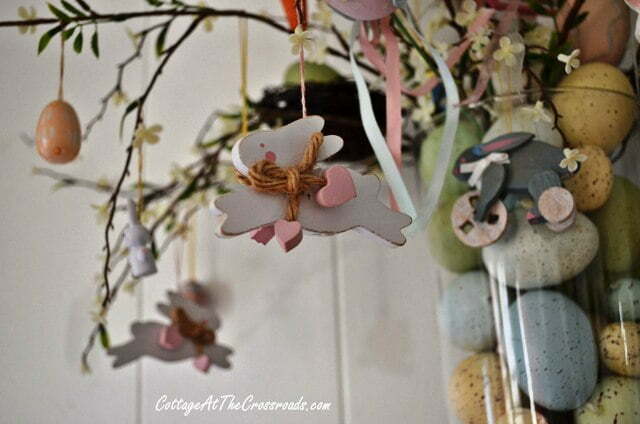 She enjoyed hanging all the little Easter ornaments on the springlike branches. She even added the birdnest within the branches. My sister-in-law Jean gave me the cute, green bunny this year, and he found a place in the arrangement. I’ve had many of these ornaments for a long time. Some of them are probably 25-30 years old. 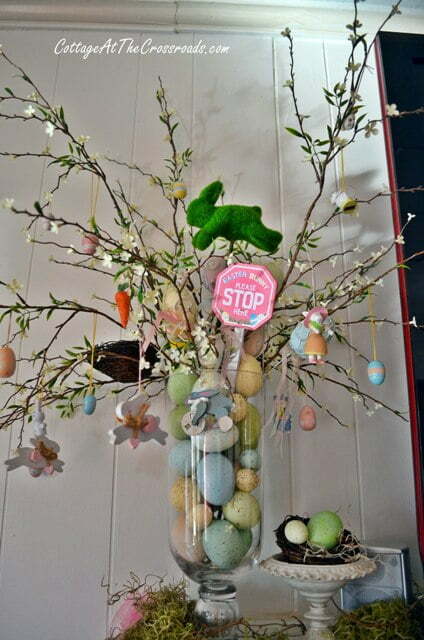 When I was teaching elementary school, I used to always put up an Easter tree in my classroom. I still couldn’t pull everything together until I spotted these green balls in a gift shop this Saturday. As soon as I saw them, I knew they’d look great on the mantel, and they’d also camouflage a speaker that’s under the TV. I started adding some green moss and bird nests and eggs, and still something was missing. Then I looked into a bag of items that a friend had given me Saturday. There were scraps of tulle and other fabric, and she knew I’d find some use for them. As soon as I saw the pink tulle, I knew! 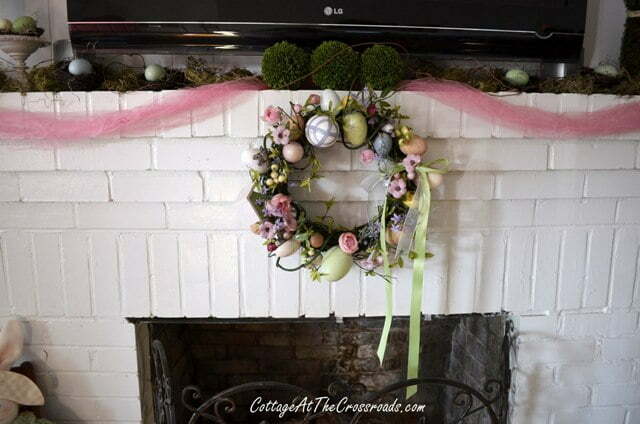 The addition of the pink tulle brought out all the pretty spring colors in the wreath! 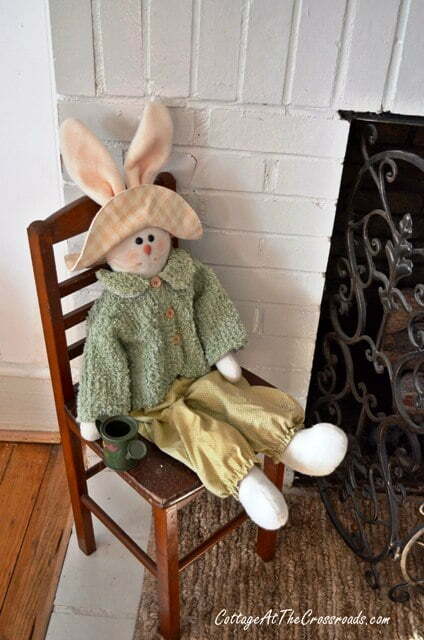 To finish the display, I added this bunny sitting in a small chair. And I added this nest of eggs in a bucket on the other side. Yep, we’re almost ready for the Easter bunny! How ’bout you? I LOVE your idea of putting the speckled eggs in the glass jar! Where did you get the eggs? I can’t seem to find any like that. 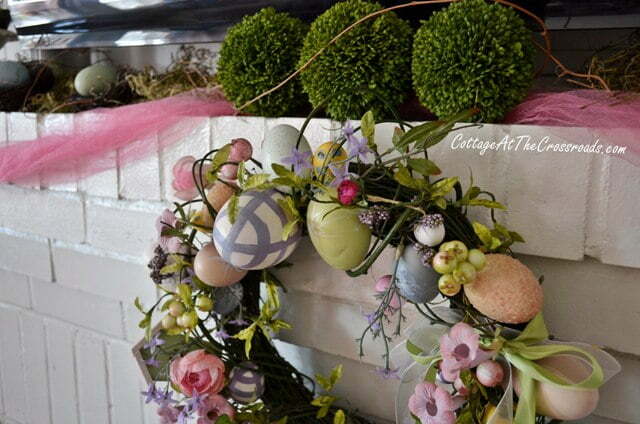 Love your spring garden mantel, Jane- so pretty and fresh. I love bunnies year round, and your moss bunny is wonderful. 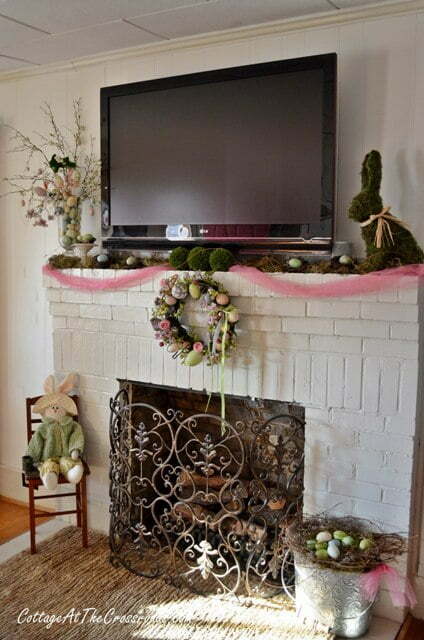 I love the vase arrangement on the mantle and especially the bucket of eggs sitting there on the floor. Such a CUTE idea Jane. Love it. 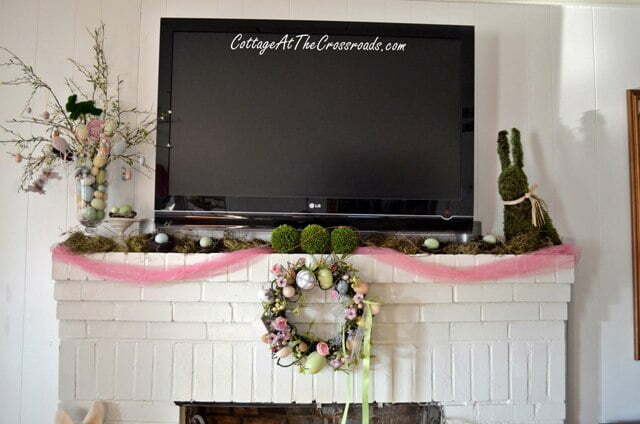 Your mantle turned out so cute, love the way the netting is swagged and I of course adore the bunnies, they are soo soo cute.. So lovely! I especially love the the wreath and the tin pail. You are so creative. 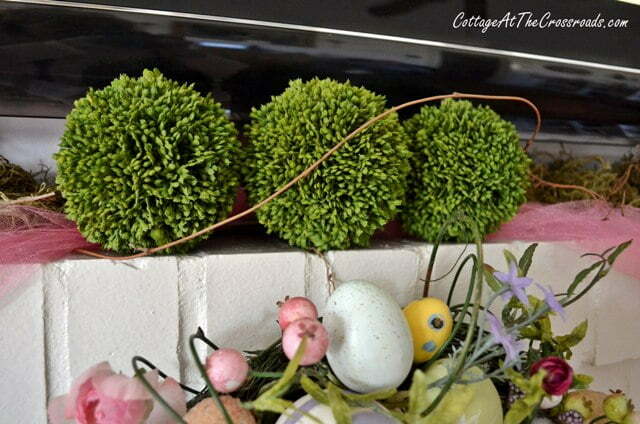 Moss, flowering branches with eggs, and cute bunnies..all perfect for the perfect Spring mantel Jane! !….was close to your “neck of the woods” this weekend….gorgeous weather! Jane, your mantle is gorgeous! I love every detail! 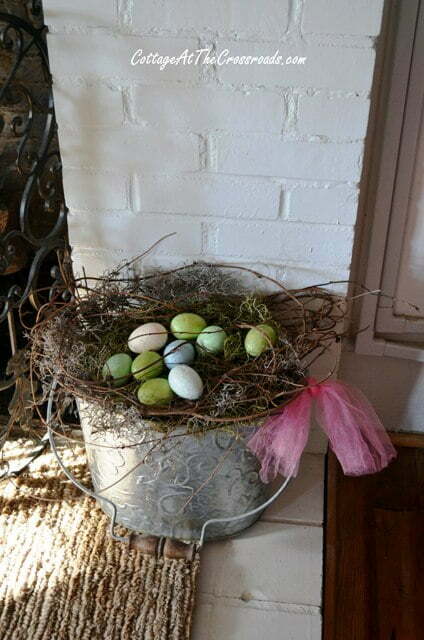 The nest of eggs in the bucket is so pretty! By the way, I am hosting a new Link party today on my blog. I am excited and scared at the same time. LOL Please, stop by if you get a chance. Enjoy your week! This is so pretty…Leo totally chose the right word! My very favorite thing is the moss bunny! I would have brought him home too without a second thought. The light and bright colors bring spring right into your room. Love it! 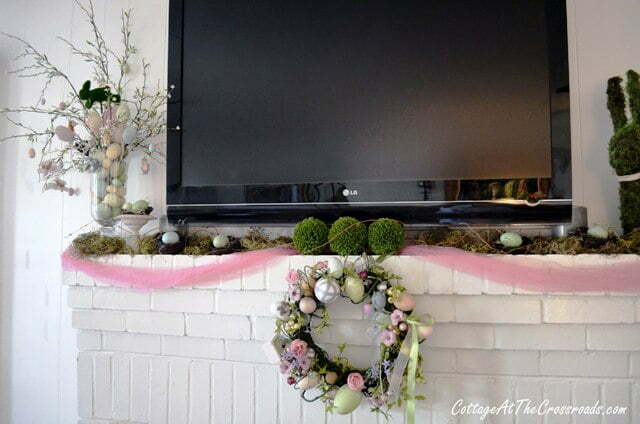 I love the pink and the mantel is beautiful. Makes me want to run out to the store and grab up more spring decorations right this minute! I always love your posts.. You’re so creative and such an inspiration. Thank you. Oh that is so very pretty! I love the pink bunting. It’s all really beautiful. Nice job! Beautiful, Jane! 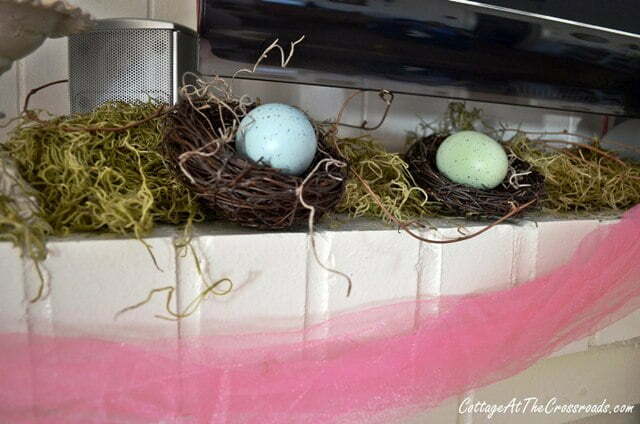 I love your vase filled with eggs … and, how clever to hide your speakers with the garden balls! Great place to hang your pretty wreath, too! Spring has arrived in your home! Can’t wait to raid my girls Easter baskets!! Love your little moss bunny and touches of pink! 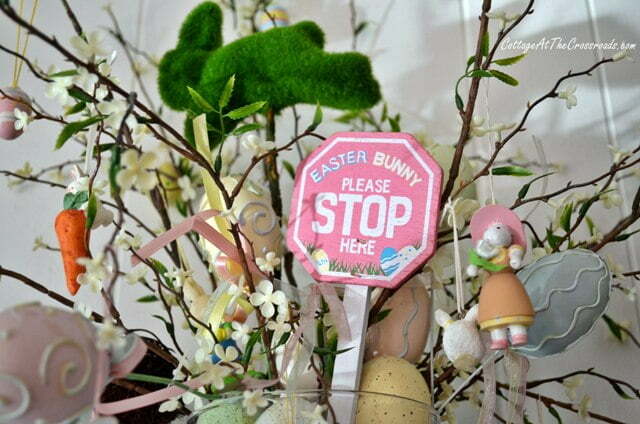 Thank you for sharing your pretty Easter mantel at NTT. 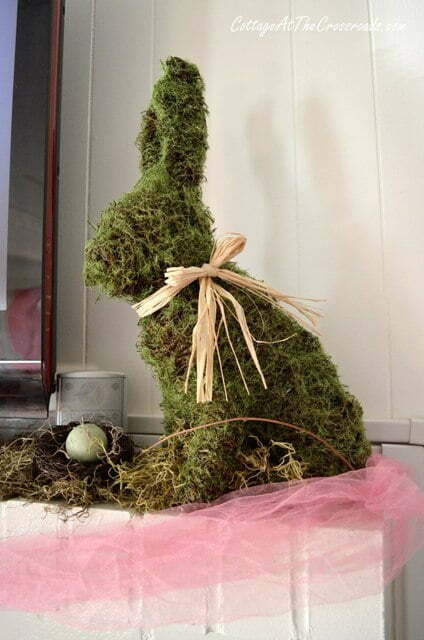 I plan to post mine later this week and you will see that we have the same cute moss bunny:) I like how you placed your nests…great idea.